Love can be a very expensive thing, especially when dating. First there are all the dinners you have to pay for, the movie tickets that must be bought, the hotel rooms when you are traveling. It’s almost like you need to start saving before you even fall into love. The Ikemenbank, “handsome men bank”, may be just what you need. 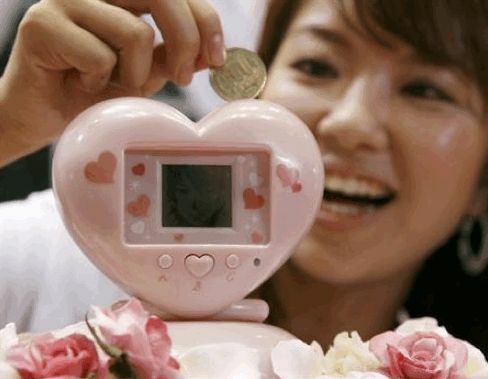 The Ikemenbank is a heart shaped electronic bank with an LCD screen that shows a virtual love interest similar to the Tomagttchi pets of the 90s. Every time you insert a yen coin, it allows you to continue with the relationship. The story ends after 100 pieces of 500 yen coins are inserted (almost $500). The love story is determined by your choices throughout the game. After it ends though, you will be $500 richer, and ready to tackle your own love story. Via Reuters.